The Douglas A-26 Invader (B-26 between 1948-1965) was a United States twin-engined light attack bomber built by the Douglas Aircraft Co. during World War II that also saw service during several of the Cold War's major conflicts. A limited number of highly modified aircraft (designation A-26 restored) served in combat until 1969. The redesignation of the type from A-26 to B-26 has led to popular confusion with the Martin B-26. Although both types used the R-2800 engine, they are completely different designs. The A-26 was an unusual design for an attack bomber of the early 1940s period, as it was designed as a single-pilot aircraft (sharing this characteristic with the RAF's de Havilland Mosquito, among others). 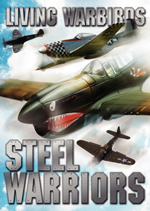 The aircraft was designed by Edward Heinemann, Robert Donovan, and Ted R. Smith. The Douglas XA-26 prototype (41-19504) first flew on 10 July 1942 at Mines Field, El Segundo, with test pilot Benny Howard at the controls. Flight tests revealed excellent performance and handling, but there were problems with engine cooling which led to cowling changes and omission of the propeller spinners on production aircraft, plus modification of the nose landing gear after repeated collapses during testing. Picture - A-26B-15-DL (41-39186) during field testing with 553d Bomb Squadron, 386h Bomb Group. The A-26 was originally built in two different configurations. The A-26B had a "solid" nose, which originally could be equipped with a combination of anything from .50 caliber machine guns, 37mm auto cannon, 20mm or even a 75mm pack howitzer, but normally the solid nose version housed six (or later eight) .50 caliber machine guns, officially termed the "all-purpose nose", later commonly known as the "six-gun nose" or "eight-gun nose". The A-26C's "glass" nose, officially termed the "Bombardier nose", contained a Norden bombsight for medium altitude precision bombing. The A-26C nose section included two fixed M-2 guns, later replaced by underwing gun packs or internal guns in the wings. 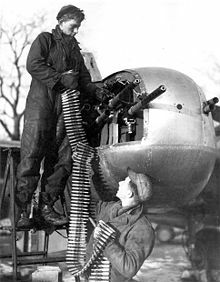 After about 1,570 production aircraft, three guns were installed in each wing, coinciding with the introduction of the "eight-gun nose" for A-26Bs, giving some configurations as many as 14 .50 in (12.7 mm) machine guns in a fixed forward mount. An A-26C nose section could be exchanged for an A-26B nose section, or vice versa, in a few man-hours, thus physically (and officially) changing the designation and operational role. The "flat-topped" canopy was changed in late 1944 after about 820 production aircraft, to a clamshell style with greatly improved visibility. Alongside the pilot in an A-26B, a crew member typically served as navigator and gun loader for the pilot-operated nose guns. In an A-26C, that crew member served as navigator and bombardier, and relocated to the nose section for the bombing phase of an operation. A small number of A-26Cs were fitted with dual flight controls, some parts of which could be disabled in flight to allow limited access to the nose section. A tractor-style "jump seat" was located behind the "navigator's seat." In most missions, a third crew member in the rear gunner's compartment operated the remotely-controlled dorsal and ventral gun turrets, with access to and from the cockpit only possible via the bomb bay when that was empty. The Douglas company began delivering the production model A-26B in August 1943 with the new bomber first seeing action with the Fifth Air Force in the Southwest Pacific theater on 23 June 1944, when they bombed Japanese-held islands near Manokwari. The pilots in the 3rd Bomb Group's 13th Squadron, "The Grim Reapers" which received the first four A-26s for evaluation, found the view from the cockpit to be poor for low level attack. General George Kenney, commander of the Far East Air Forces stated that, "We do not want the A-26 under any circumstances as a replacement for anything." Until changes could be made, the 3rd Bomb Group requested additional A-20 Havocs, although both types were used in composite flights. The 319th Bomb Group worked up on the A-26 in March 1945, joining the initial 3rd BG, with the 319th flying until 12 August 1945. The A-26 operations wound down in mid-August 1945 with only a few dozen missions flown. A-26s began arriving in Europe in late September 1944 for assignment to the Ninth Air Force. The initial deployment involved 18 aircraft and crews assigned to the 553d Squadron of the 386th Bomb Group. This unit flew its first mission on 6 September 1944. 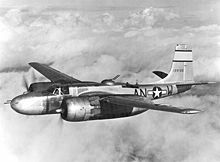 The first group to fully convert to the A-26B was 416th Bombardment Group with which it entered combat on 17 November, and the 409th Bombardment Group, whose A-26s became operational in late November. Due to a shortage of A-26C variants, the groups flew a combined A-20/A-26 unit until deliveries of the glass-nose version caught up. Besides bombing and strafing, tactical reconnaissance and night interdiction missions were undertaken successfully. In contrast to the Pacific-based units, the A-26 was well received by pilots and crew alike, and by 1945, the 9th AF had flown 11,567 missions, dropping 18,054 tons of bombs, recording seven confirmed kills while losing 67 aircraft. The USAF Strategic Air Command had the renamed B-26 (RB-26) in service from 1949 through 1950, the Tactical Air Command through the late 1960s, and the last examples in service with the Air National Guard through 1972. The US Navy also used a small number of these aircraft in their utility squadrons for target towing and general utility use until superseded by the DC-130A variant of the C-130 Hercules. The Navy designation was JD-1 and JD-1D until 1962, when the JD-1 was redesignated UB-26J and the JD-1D was redesignated DB-26J. B-26 Invaders of the 3d Bombardment Group, operating from bases in Southern Japan, were some of the first USAF aircraft engaged in the Korean War, carrying out missions over South Korea on 27 and 28 June, before carrying out the first USAF bombing mission on North Korea on 29 June 1950 when they bombed an airfield outside of Pyongyang. Picture - A B-26C Invader on a bombing run over Korea. On 10 August 1950, the 452nd Reserve Bomb Wing was activated for Korean Service. This was the first time that an entire air force unit had ever been activated. It flew its first missions in November 1950 from Itazuke Japan doing daylight support with the 3rd Bomb Wing flying night missions. Because of the Chinese intervention it was forced to find another base and moved to Miho Air base on the west coast of Honshū. In early 1951 it moved to East Pusan Air Base and continued its daylight as well as night intruder missions. In June 1951, it joined the 3rd Bomb Wing in night activity only, dividing the target areas with the 452nd taking the eastern half and the 3rd the western. For its efforts in the Korean War, it was awarded 2 Unit Citations and the Korean Presidential Citation. It also received credit for eight Campaign Operations. In May 1952 it was inactivated and all of its aircraft and equipment along with its regular air force personnel were absorbed by the 17th Bomb Wing. During its time as an active unit, the 452nd flew 15,000 sorties (7000 at night) with a loss of 85 crewmen. 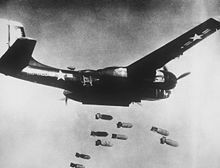 B-26s were credited with the destruction of 38,500 vehicles, 406 locomotives, 3,700 railway trucks, and seven enemy aircraft on the ground. On 14 September 1951, Captain John S. Walmsley, Jr. attacked a supply train. When his guns jammed, he illuminated the target with his searchlight to enable his wingmen to destroy the train. Walmsley was shot down and posthumously awarded the Medal of Honor. Invaders carried out the last USAF bombing mission of the war 24 minutes before the Armistice Agreement was signed on 27 June 1953. In the 1950s, the French Air Force's (Arm�e de l'air) Bombing Groups (Groupe de bombardement) including GB 1/19 Gascogne and GB 1/25 Tunisia used USAF-lent B-26 during the First Indochina War. Cat Bi (Haiphong) based Douglas B-26 Invaders operated over Dien Bien Phu in March and April 1954 during the siege of Dien Bien Phu. In this period, a massive use of Philippines based USAF B-26s against the Viet Minh heavy artillery was planned by the U.S. and French Joint Chief of Staff as Operation Vulture, but was eventually cancelled by the respective governments. In 1958, the CIA started Operation Haik in Indonesia, concerned about the Sukarno regime's communist leanings. At least a dozen B-26 Invaders were committed in support of rebel forces. On 18 May 1958, American contract pilot Allen Pope's B-26 was initially hit by anti-aircraft ground fire and then brought down by a North American P-51 Mustang flown by Capt. Ignatius Dewanto (the only known air-to-air kill in the history of the Indonesian Air Force). The capture and trial of Lieutenant Pope brought a quick end to Operation Haik, but the capabilities of the Invader were not lost on the Indonesian government. In 1959, the government purchased six aircraft at Davis-Monthan AFB and these were ferried to Indonesia in full military markings during mid-1960. These aircraft would have a long career and were utilized in a number of actions against rebels in various areas. The last operational flights of the three survivors was in 1976 supporting the Indonesian invasion of East Timor. In 1977, the last two flyers were retired. The first B-26s to arrive in Southeast Asia were deployed to Takhli RTAFB, Thailand in December 1960. These unmarked aircraft, operated under the auspices of the U.S. CIA (Central Intelligence Agency), were soon augmented by an additional 16 aircraft, 12 B-26Bs and B-26Cs plus four RB-26Cs under Operation Mill Pond. The mission of all of these aircraft was to assist the Royal Lao Government in fighting the Pathet Lao. The repercussions from the Bay of Pigs invasion meant that no combat missions are known to have been flown, although RB-26Cs operated over Laos until the end of 1961. The aircraft were subsequently operated in South Vietnam under Project "Farm Gate". The only other deployment of B-26 aircraft to Laos prior to the introduction of the B-26K/A-26A, was the deployment of two RB-26C aircraft, specifically modified for night reconnaissance, deployed to Laos between May and July 1962 under Project Black Watch. These aircraft, initially drawn from Farm Gate stocks, were returned upon the end of these missions. The aircraft from Laos participated in the early phase of the Vietnam War with the USAF, but with Vietnamese markings as part of Project Farm Gate. Though Farm Gate operated B-26Bs, B-26Cs, and genuine RB-26Cs, many of these aircraft were operated under the designation RB-26C, though they were used in a combat capacity. 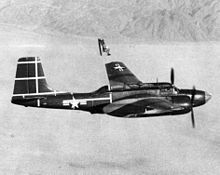 During 1963, two RB-26C were sent to Clark AB in the Philippines for modifications, though not with night systems as with those modified for Black Watch. The two aircraft returned from Black Watch to Farm Gate were subsequently given the designation RB-26L to distinguish them from other modified RB-26C, and were assigned to Project Sweet Sue. Farm Gate's B-26s operated alongside the other primary strike aircraft of the time, the T-28 Trojan, before both aircraft types were replaced by the Douglas A-1 Skyraider. The B-26s were withdrawn from service in February 1964 after two accidents related to wing spar fatigue, one during combat in Southeast Asia in August 1963 and one during an airpower demonstration at Eglin AFB, Florida in February 1964. On 11 February 1964, two pilots from the 1st Air Commando Wing stationed at Hurlburt Field, Fla., died in the crash of a B-26 on Range 52 at Eglin AFB when it lost a wing during pull-out from a strafing pass. The aircraft was participating in a demonstration of the Special Air Warfare Center's counter insurgency capabilities and had completed a strafing run when the accident occurred. SAWC had presented the demonstration on an average of twice each month for the previous 21 months. B-26 aircraft used by USAF Commandos in Vietnam were grounded 8 April 1964, following an official investigation into the 11 February accident. B-26 aircraft in use by the Vietnamese Air Force were also grounded in accordance with the U.S. ruling. Picture - An A-26K of the 609th SOS in 1969. In response to this, the On Mark Engineering Company of Van Nuys, California was selected by the Air Force to extensively upgrade the Invader for a counterinsurgency role. The first production flight of the B-26K was on 30 May 1964 at the Van Nuys Airport. On Mark converted 40 Invaders to the new B-26K Counter-Invader standard, which included upgraded engines, propellers, and brakes, re-manufactured wings, and wing tip fuel tanks, for use by the 609th Special Operations Squadron. In May 1966, the B-26K was re-designated A-26A/K for political reasons (Thailand did not allow the U.S. to have bombers stationed in country, so the Invaders were redesignated with an "A", for attack aircraft) and deployed in Thailand to help disrupt supplies moving along the Ho Chi Minh trail. Two of these aircraft were further modified with a Forward Looking Infrared (FLIR system) under project Lonesome Tiger, as a part of Operation Shed Light. In early 1961, about 20 B-26Bs, most converted from B-26C configuration, were 'sanitized' at Duke Field (aka Auxiliary Field Three at Eglin AFB). They had defensive armament removed, and were fitted with the eight-gun nose, underwing drop tanks, and rocket racks. They were flown to a CIA-run base in Guatemala where training was underway of B-26, C-46 and C-54 Cuban exile air crews by personnel from the Alabama ANG (Air National Guard). After transfer to Nicaragua in early April 1961, they were painted in the markings of the FAR (Fuerza A�rea Revolucionaria), the air force of the Cuban government. On 15 April 1961, crewed by Cuban exiles, eight B-26s of the FAL (Fuerza A�rea de Liberacix�n) attacked three Cuban airfields, in an attempt to destroy FAR combat aircraft on the ground. On 17 April 1961, FAL B-26s supported the seaborne Bay of Pigs Invasion of Cuba. The conflict ended on 19 April, after the loss of nine FAL B-26s, 10 Cuban exiles and 4 American aircrew in combat. The FAR flew B-26Cs in the conflict, one of which was shot down by a CIA 'command ship' with the loss of 4 Cuban aircrew. CIA contracted pilots, some previously employed during the Bay of Pigs Invasion, flew B-26Ks for ground attack against Simba rebels in the Congo Crisis. New production B-26K Counter-Invaders were delivered to the Congo via Hurlburt Field in 1964. The Portuguese Air Force purchased Invaders covertly for use in Portuguese Angola in 1965, during the Portuguese Colonial War. 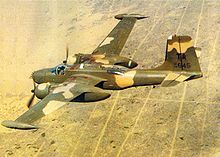 Biafra used two provisionally armed B-26s in combat during Nigerian Civil War in 1967, flown among others by Jan Zumbach. The large majority of the A-26/B-26 Invader's production run of 2,452 were early A-26Bs and A-26Cs. Serial no. 41-19588 was a prototype "solid-nosed" attack variant with crew of three: pilot, gun loader/navigator (in front cockpit) plus gunner in rear, and carrying a forward firing 75 mm (2.75 in) cannon. Attack bomber with solid nose carrying six or eight 0.50 in (12.7 mm) machine guns. Production totals: 1,355 A-26Bs were built and delivered, 205 at Tulsa, Oklahoma (A-26B-5-DT to A-26B-25-DT) plus 1,150 at Long Beach, California (A-26B-1-DL to A-26B-66-DL). About 24 more airframes were built at Long Beach but not delivered to USAAF, some of those later sold to other civil and military customers. A-26B was redesignated B-26B with USAF in 1948. Unarmed variant converted from B-26B for training purposes. Unarmed variant converted from B-26B for administrative purposes. Attack bomber. Production totals: 1,091 A-26Cs were built and delivered, five at Long Beach, California (A-26C-1-DL and A-26C-2-DL) plus 1,086 at Tulsa, Oklahoma (A-26C-16-DT to A-26B-55-DT). About 53 more airframes were built at Tulsa but not delivered to USAAF, some of those later sold to other civil and military customers. A-26C was redesignated B-26C with USAF in 1948. Unarmed photo reconnaissance variant converted from B-26C; it carried cameras and flash flares for night photography. Designated FA-26C prior to 1962. Unarmed variant converted from B-26C for training purposes. Serial no. 44-34776 prototype for the proposed A-26D attack bomber with uprated Chevrolet manufactured R-2800-83 engines, and late model A-26B armament of eight 0.50 in (12.7 mm) machine guns in solid nose and six 0.50 in (12.7 mm) guns in the wing; series of 750 A-26Ds was cancelled after V-J Day. Serial no. 44-25563 prototype for the A-26E attack bomber. 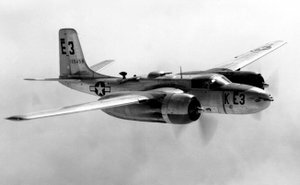 As with the XA-26D but with an A-26C-type glass nose; a contract for 2,150 A-26E-DTs was cancelled following V-J Day. Serial no. 44-34586 prototype for a high-speed A-26F powered by two 2,100 hp (1,600 kW) R-2800-83 engines driving four-bladed propellers with a 1,600 lbf (7.1 kN) s.t. General Electric J31 turbojet installed in the rear fuselage. The prototype reached a top speed of 435 mph (700 km/h) but the series was cancelled as performance gains were not sufficient. Unofficial designation for a proposed postwar production version of the A-26. It was to have a more powerful version of the Pratt &amp; Whitney R-2800 radial engine and was to be fitted with such features as a raised pilot's cockpit canopy, an improved cockpit arrangement and wingtip drop tanks. If produced, the unglazed nose version would have been designated A-26G and the glazed nose version A-26H. 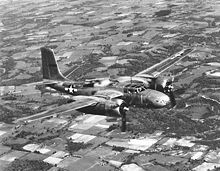 However, in October 1945, the USAAF concluded that there were enough A-26 aircraft to meet postwar needs, consequently, the "A-26Z" version was not produced. US Navy version with one A-26B (44-34217) and one A-26C (44-35467) redesignated during World War II, postwar, 150 surplus A-26s for use by land-based utility squadrons as target tugs and later, drone directors (designated JD-1D) and general utility aircraft. In 1962, the JD-1 and JD-1D were redesignated UB-26J and DB-26J respectively. On Mark Engineering prototype for refurbished attack bomber; modifications included rebuilt, strengthened wings, enlarged tail assembly, new R-2800-103W engines with reversible propellers/propeller spinners, dual controls, wingtip tanks, newer avionics and increased hardpoint/armament enhancements. 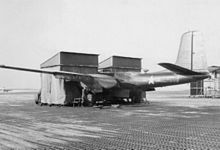 On Mark Engineering conversions of 40 B-26Bs or TB-26Bs with two B-26Cs and a single JB-26C; changes included fitting of 2,500 hp (1,900 kW) R-2800-52W engines with no propeller spinners and the six wing guns deleted. During operations in Vietnam, in May 1966, the aircraft were reassigned the old attack designation of A-26A. The A-26As were retired in 1969 when they had reached the safe limits of allotted flying time. Two RB-26Cs (44-34718 and 44-35782) modified for night photography missions. Unofficial designation applied to B-26s operated by the French Air Force (Armée de l'air) in Algeria as night fighters. These aircraft were modified B-26Cs fitted with AI Mk X radar taken from obsolete Meteor NF 11 night fighters, two underwing gun packs each with two 0.50 in (12.7 mm) M2 Browning machine guns and SNEB rocket pods. Since 1945, over 300 A-26s have been entered on to the FAA US Civil Aircraft Register. Perhaps up to a hundred of those were probably only registered for ferry flights from USAF bases such as Davis-Monthan AFB, AZ and Hill AFB, UT to civil airports and stored as candidates for sale on the civil or overseas military markets. The initial main civil uses were as "executive" personnel transports with minimal modifications such as removal of military features, bomb bay doors sealed shut, passenger entry stairs in bomb bay, and the conversion of the fuselage to accept six to eight passengers. Improvements developed considerably until the early 1960s, when purpose-built executive types such as the (turboprop) Gulfstream started to become available. During the mid-1950s, A-26s were tested and used as air tankers for suppression of forest and wildland fires, and may have briefly used borate-based retardants, hence the inaccurate and unofficial term "borate bombers." Borate was soon discontinued due to its undesirable ecologic effects, replaced with retardant mixtures of water, clays, fertilizers and red dyes. That use of A-26s on USDA contracts was discontinued in major regions by about 1973, when many of the A-26 air tankers then found willing purchasers in Canada. Much early development of conversions was carried out by Grand Central Aircraft, whose drawings and personnel were taken up by the On Mark Engineering Company of Van Nuys, California from about 1955. By the 1960s, On Mark had obtained an exclusive licence from Douglas Aircraft Company for manufacture and sale of parts for A-26s. The On Mark Executive (1956), the On Mark Marketeer (1957), and the more radical pressurized On Mark Marksman (1961) were products of this effort. The next most significant conversion was the Rock Island Monarch 26, while less numerous and more basic conversions were carried out by Wold Engineering, LB Smith Aircraft Corp., R. G. LeTourneau Inc, Rhodes-Berry Company and Lockheed Aircraft Service Inc.
Garrett AiResearch used two A-26 variants as testbeds for turbine engines; see also XA-26F above. In July 2005, Time Team from UK's Channel 4 TV, along with members of RAF Millom Museum, took part in a major project to excavate the crash sites of two A-26 Invader aircraft which had collided shortly after take-off over marshes close to the then USAAF BAD 2 airbase at Warton in Lancashire on 29 November 1944. The aircraft, A-26B-10-DT 43-22298 (pilot: 2nd Lt. Kenneth E. Hubbard accompanied by Pvt. 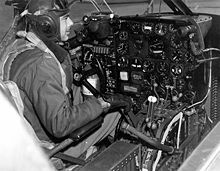 John F. Guy) and A-26B-15-DT 43-22336 (2nd Lt. Norman Zuber unaccompanied), had been en route to Br�tigny, Oise in northern France to take up service with the 641st Squadron of the 409th Bombardment Group. Francillon, Ren�. "The Douglas Invader Story". Air Enthusiast, Number Seven, July-September 1978. Bromley, Kent, UK: Pilot Press Ltd., 1978. pp. 215-234. Hagedorn, Dan and Leif Hellstrx�m. Foreign Invaders, the Douglas invader in Foreign Military and US Clandestine Service. Earl Shilton, Leicester, UK: Midland Publishing, 1994. 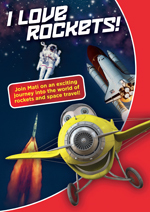 ISBN 1-85780-013-3. Horne, John E. "Douglas B-26s In Korea". Air Enthusiast, Number 24, April-July 1984. Bromley, Kent UK: Pilot Press. pp. 50-59. 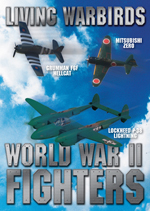 Mikesh, Robert C. "Flying the Invader: Pilot Notes for the Douglas A-26". Air Enthusiast, Number Seven. July-September 1978. Bromley, Kent, UK: Pilot Press Ltd., 1978, pp. 234-236. O'Leary, Michael. "Database:Douglas Invader". 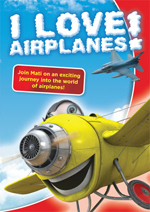 Aeroplane, May 2002, Vol. 30, No.5, pp. 37-58. London: IPC. Smith, Mark E. USAF Reconnaissance in South East Asia (1961-66). San Francisco: Headquarters, Pacific Air Force, Department of the Air Force, 1966.